Finally. Can we end this crap meme about a terrible movie? @MattF, no, but we can stop a crap meme from a great movie. 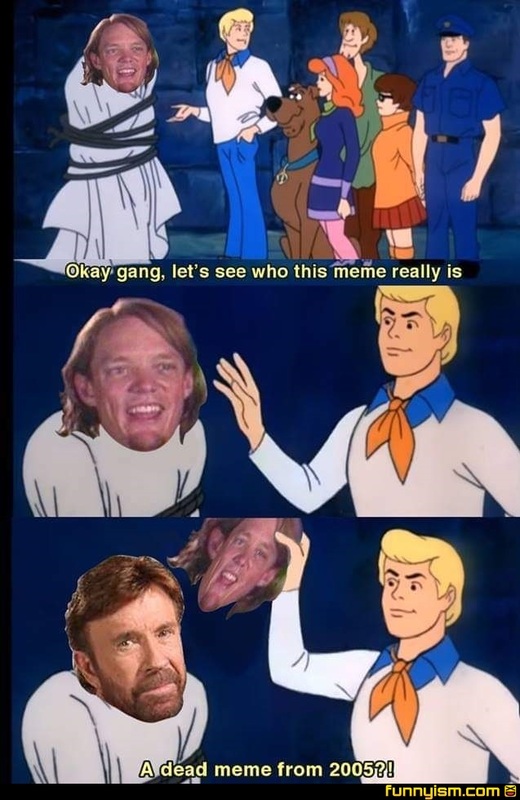 Most realistic shaggy/Norris meme yet; Chuck killed Shaggy and wore his face as a mask. This version is way better it uses a wimpy character to add an extra layer of humor and the format is much more inventive. I know the dudes who started that meme, well at least the dudes who started it in my school. IDK most the time shaggy only uses 1 percent or less of his power and is pretty equally matched with Chuck Norris. I think shaggy is definitely the more powerful one.